I have been growing roses since 1971 and have been a member of the American Rose Society way before they moved their headquarters to Shreveport. Over the years of my growing roses and joining the local society, I pride myself of having planted the most beautiful flower in the world. I have been a member of the ARS long before I joined my local society. Only at the behest of a friend of mine who told me I can exhibit my roses did I join a local society and the rest is history. I cut my first bloom and won the novice class and I was hooked. From then on, I exhibited my roses every year but I never made the Queen of Show. I won blues and silver trophies in other classes. There was one person in our society who always won the top three awards all the time. That discouraged me in showing my roses in the One Bloom Hybrid Tea class. This exhibitor grew 1,100 roses, he told me. Nobody could compete with him for a long time until one member gave him a run for his money. Since I knew I would never win the Queen, I geared myself to exhibiting in other classes. After a while, I tried my hand in exhibiting at the Arrangement Section which I found more fun and interesting. One year, we introduced Hi-Lo class. The weather was terrible prior to the show and nobody had a good specimen. Since I never exhibited for the Queen, I entered the Hi-Lo class. I knew I would win the first silver trophy in that class and I did. After the show, the other top exhibitor told me I should have entered my roses in the Hybrid Tea class and the Mini class. I had the best specimens. I didn’t even think of it. I lost my only chance of winning the Queen and the Mini Queen! The reason I’m bringing this up is the rose show always emphasizes Hybrid Teas. Nowadays, unless you are die-hard exhibitors and most of them are the old guard, only a few of the new members want to put that kind of effort to get to the Queen of Show. Most gardeners do not want to spray chemicals anymore. Chemicals are not good for gardeners. I often wonder how much damage those chemicals are doing to the health and well-being of us and our neighbors, not to mention our environment. More and more of our rose friends died of cancer. It’s a bit scary to me. There is also one thing that bothers me about rose shows. There are very few judges who know about shrubs and Old Garden Roses. Their main focus is Hybrid Teas. Since most of the judges grow mostly Hybrid Teas, they can’t possibly be able to judge OGRs correctly. Since there is a resurgence of OGRs and shrub roses, the ARS should rule that ARS judges should grow more OGRs and not just Hybrid Teas. To grow them is to know them! I love rose shows. 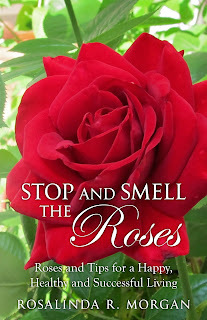 It is an educational tool to show the public that the Rose is truly the Queen of Flowers. But here is an interesting quote that is food for thought for rose societies for their rose shows. I often wonder if this emphasis on having a perfect rose to the detriment of our health is the big issue why people have the notion that roses are difficult to grow. Has anyone noticed that in most of our meetings, the speaker talked so much of chemicals and putting on HazMat gear while spraying their roses? That would definitely scare your neighbors. If I am a prospective member at those meetings, I would definitely find the nearest exit door. I may be in the minority on this topic but I stopped spraying about 30 years ago. My roses looked awful the first year but by the second year, the roses improved. They had to survive otherwise I yanked them out. Nowadays, I only buy disease-resistant roses. I also like fragrant roses. I don’t care about perfect form if there is no fragrance. It has also been proven that monoculture invites pests and diseases so I do companion plantings. It helps confuse pests and enables me to have continuous color in the garden all season long.